Visakhapatnam, also known as Vizag is the largest city in the state of Andhra Pradesh and the third largest city on the east coast of India (after Chennai and Kolkata). It is a port city on the southeast coast of Bay of Bengal and often called as The Jewel of the East Coast and the City of Destiny. As of 2011, the population was recorded as 2,091,811 and occupying 681.96 km2 (263.31 sq mi), it is the administrative headquarters of Visakhapatnam district. Visakhapatnam is the largest city and a commercial hub of Andhra Pradesh, with a GDP of over INR26 billion (US$430 million).It is situated in the Eastern Ghats and on the coast of Bay of Bengal on the east. The city is known for heavy industries,steel plant, largest seaport of India and oldest shipyard. It has the only natural harbour of India and headquarters of theEastern Naval Command of the Indian Navy. The city Was ruled by Andhra Kings of Vengi, Kalinga and after that to the Pallavas. The city is named after Sri VishakaVarma, Legend has it that Radha and Viśakha were born on the same day, and were equally beautiful. Sri Vishaka Sakhi, isthe second most important gopi of the eight main gopis. She carries messages between Radha and Krishna, and is the most expert gopi messenger. Local residents believe that an Andhra king,built a temple to pay homage to his family deityViśakha. This is now inundated under sea water near R K Beach. Another theory is that it is named after a women disciple of Buddha named Viśakha.Later it was ruled by Qutb Shahis, Mughal Empire (between 1689–1724), Nizam (1724–1757) and France (1757–1765) before being captured by the British in 1765. Pavurallakonda ("pigeon hill") is a hillock west of Bhimli, about 24 km (15 mi) from Visakhapatnam. The Buddhist settlementfound here is estimated to date back from the first century BC to the second century AD. On the hillock (which overlooksthe coastline) are 16 rock-cut cisterns for collecting rainwater. Gopalapatnam, on the Tandava River, is a villagesurrounded by brick stupas, viharas, pottery and other Buddhist artefacts. In 1907 British archaeologist Alexander Rea unearthed Sankaram, a 2,000-year-old Buddhist site. 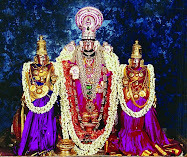 The name "Śankaram" derivesfrom the Sangharama (temple or monastery). Located 40 km (25 mi) south of Visakhapatnam, it is known locally asBojjannakonda and is a significant Buddhist site in Andhra Pradesh. The three major schools of Buddhism (Hinayana, Mahayana and Vajrayana) flourished here. The complex is known for its monolithic stupas, rock-cut caves and brick structures. Theprimary stupa was initially carved out of rock and covered with bricks. Excavations yielded historic pottery and Satavahanacoins from the first century AD. At Lingalakonda, there are also rock-cut monolithic stupas in rows spread over the hill.The vihara was active for about 1,000 years. to the mortal remains of the Budda. The word Bavikonda in Telugu means "a hill of wells". Fitting its name, Bavikonda is a hill with wells for the collection of rainwater. It is located 15 km (9.3 mi) from Visakhapatnam and is a significant Buddhist site. Excavation carried out from 1982–1987 revealed a Buddhist establishment including a mahachaitya embedded with relic caskets,[clarification needed] a large vihara complex, numerous votive stupas, a stone-pillared congregation and rectangular halls and a refectory. Artifacts recovered from the site include Roman and Satavahana coins and pottery dating from the third century BC to the second century AD. A significant finding was a piece of bone (with a large quantity of ash) in an urn, which is believed to be the remains of the Buddha. The Bavikonda site is considered one of the oldest Buddhist sites in Asia. It is a reminder of the Buddhist civilisation which once existed in southern India, and alsoreminiscent of Borobudur in Indonesia. the area under the Visakhapatnam Nizam during the late 15th and early 16th centuries. European merchants from France,Holland and the East India Company used the natural port to export tobacco, paddy, coal, iron ore, ivory, muslin and other textile products.Local legend tells that an Andhra king, on his way to Benares, rested at Visakhapatnam and was so enchanted by its beauty that he ordered a temple to be built in honour of his family deity, Viśakha. Archaeological sources, however, reveal that the temple was probably built between the 11th and 12th centuries by the Cholas. A shipping merchant, Shankarayya Chetty,built one of the mandapams (pillared halls) of the temple. Although it no longer exists (possibly washed away about 100 years ago by a cyclonic storm), elderly residents of Visakhapatnam remember visits to the ancient shrine by their grandparents (although author Ganapatiraju Atchuta Rama Raju denies this).During the 18th century Visakhapatnam was part of the Northern Circars, a region comprising coastal Andhra and southern coastal Odisha which was first under French control and later British. Visakhapatnam became a district in the Madras Presidency of British India. In September 1804, British and French squadrons fought the naval Battle of Vizagapatam near the harbour. After India's independence it was the largest district in the country, and was subsequently divided into thePart of the city is known by its colonial British name, Waltair; during the colonial era, the city's hub was the Waltairrailway station and the surrounding part of the city is still called Waltair. Visakhapatnam is located on the sea shore of Bay of Bengal in the East, bordering on the North with the State of Orissa andVizianagaram district and East Godavari District to the South. The city coordinates lies between 17.6883° N latitude, and 83.2186° E longitude. It's periphery consists of plains along the coast line while the interiors boast of the beautiful hills of the Eastern Ghats which surround it on the North and the West. This region is also called the Agency Division. It occupies an area of approximately 11,161 km2 (4,309 sq mi). 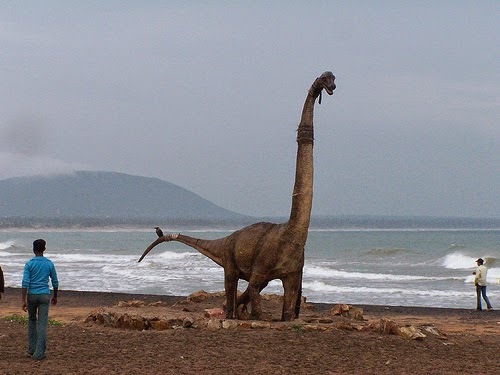 Visakhapatnam has a tropical savanna climate (Köppen climate classification Aw), with little change in temperature throughout the year. May is the hottest month with an average maximum temperature about 36 °C (97 °F), and January is the coolest month with an average maximum temperature near 28 °C (82 °F). The city has very hot, humid summers and warm, humid winters. The lowest temperature ever recorded in the city was 10 °C (50 °F), while the highest was 45.5 °C (113.9 °F). With the city's location on the Bay of Bengal, the humidity is high throughout the year, highest in September and lowest in December, however with a difference of only 10%. Total annual rainfall is about 1,265 millimetres (49.8 in), most of which falls during the southwest monsoon. October is the wettest month, with about 254 millimetres (10.0 in) of rainfall.November through February is the best time to visit Visakhapatnam weather-wise, since temperatures are moderate. Telugu is the official language of Visakhapatnam. It is also the most widely spoken language of the state of AndhraPradesh. Two dialects of Telugu are spoken by the people, the common dialect and the Uttarandhra dialect. The latter ismainly spoken by the people who originally belong to the districts of Visakhapatnam, Vizianagaram and Srikakulam.Besides Telugu, Hindi is also popular language of Visakhapatnam. Visakhapatnam is a cosmopolitan city where people fromdifferent parts of India reside. Hence, English is also widely spoken among the people.A substantial population of Visakhapatnam comprise Bengalis and Oriyas. Also, other people from other states are alsopresent due to the Naval presence and high concentration of public-sector employers. There is also an Anglo-Indiancommunity. Visakhapatnam has developed into a major economic destination,. It has all the sectors like Industrial, Fishing, IT,Pharma, Export & Imports by Sea trade etc. The city was identified as one of the fastest-growing in the world, economicallyand demographically. Several factors contributed to its economic growth, including the natural harbour, rail, roadand air connectivity to national and International destinations. Tourism also plays an important role in generating revenueto the state of Andhra Pradesh, with many tourist spots in and around the city, attracts large number of tourists. Fishing is a major sector in Visakhapatnam. It has one of the largest, dedicated harbour in the country for the fishingindustry and seafood exports. A number of fishermen has their livelihoods depend on Fishing in the city. The ice factoriesin and outside the Visakhapatnam Fishing Harbour, caters to the needs of the fishermen and provides employment as well.Ports include Visakhapatnam Port, Gangavaram Port in the city. They serve as a gateway for contributing to the development of the petroleum, steel and fertiliser industries. It is a hub for iron ore and other mineral exports which are exported by sea to other countries. Fishing Harbour at Visakhapatnam Port Trust is one of the biggest in the Coastal corridor of Andhra Pradesh generating huge revenue. There are many SEZ's & industrial corridors such as, VSEZ, APSEZ, APIIC, Aganumpudi Industrial Park, Visakha Dairy, JNPC,Brandix Apparel City etc., are located in and around the city. local jobs.The SEZ has textile manufacturers namely Pioneer Elastic Fiber, Ocean India, Quantum Clothing, Fountain Set Group and Limited Brands. Pilkington, an automotive-glass manufacturer is also has its company.Drugs and Pharmaceuticals: The dawn of Pharma City changed the face of Vizag's industrial development. Jawaharlal Nehru Pharma City (JNPC) is the only pharmaceutical SEZ in India, with 58 pharmaceutical companies including PharmaZell of Germany and Eisai Pharma of Japan. The defence controlled Hindustan Shipyard built India's first ship Jala Usha. Ports and Shipyard led to many privatesectors to set up large-scale industries. Some of them include, Visakhapatnam Export, GAIL, HPCL, BHPV, Hindustan Zinc,Dredging Corporation of India, Coromandel Fertilizers, RINL and LG Polymers, Jindal Stainless Steels, Synergies Castings,Rain Calcining Limited, Reliance, Brandix, Essar Pellet Plant, Andhra (Cements, Petrochemicals and Ferroalloys) Ltd. etc. Visakhapatnam has a steel plant, whose corporate entity RINL is the second largest state-run steel industry. The capacity of the plant is 6.3MT, is planned to become a 20MT plant in the future, the largest plant in a single location. The plant had revenues of INR144570 million (US$2 billion) for 2011–2012 and has about 17,800 employees. Located on Beach Road, the hotel has air-conditioned suites, air-conditioned rooms and standard rooms, which are located onthe ground floor. This hotel is perfect to enjoy the wonders and attractions that the city has to offer. Located on Bhimli Road, Rushikonda, this beautiful beach resort has a presidential suite, 10 luxury rooms, air-conditioned executive and deluxe rooms and standard air-conditioned rooms. Guests can enjoy the beautiful waters of the Bay of Bengal and the pristine sandy beach while staying at this resort. This unique and idyllic resort has wooden cottages, with and without air-conditioning and wooden log huts. It has a wonderful restaurant and a fabulous view tower. It is the perfect place for trekking on trails in the forests, bird watching, and enjoying tribal dances and sports. It is the resort for a rural holiday in Andhra Pradesh. 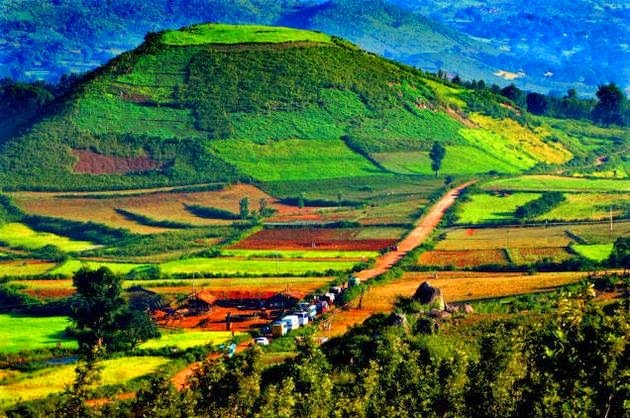 Located at a height of 3,200 feet in the midst of the hills of Anantagiri, Araku Valley is a beautiful and enchanting hillstation. The salubrious climate, musically gurgling streams, the rainbow-creating waterfalls and lush green landscape canoffer a memorable escape from the city life. The valley is located about 112 kilometres from Visakhapatnam. Araku Valley ishome to 19 indigenous tribes and offers a wonderful opportunity to get insights into the lifestyle of these tribes andtheir culture and traditions. Dhimsa dance, a kind of folk dance, is a major attraction for its rhythmic beats and colourful costumes. Itika Pongal is a popular festival that is celebrated in the region and is worth experiencing. Located amidst lush greenery of Araku Valley, this resort is a yatri nivas that offers air-conditioned suites, non-air-conditioned suites and non-air-conditioned deluxe rooms. It is tranquil and peaceful and has well-landscaped gardens to relax, rest and rejuvenate. Enjoy the natural beauty of Araku Valley and its hidden treasures while staying at the Haritha Mayuri. It has suites,deluxe rooms and standard rooms, all air-conditioned. It also has deluxe rooms without air-conditioning. The resort has a wonderful craft center that is worth exploring. are called Gosthani William King George belonging to the Geological Survey of India was instrumental in discovering Paleolithic implements in 1807. It is believed that these implements were about 1 million years old. massive statues of Lord Shiva and Goddess Parvati made from white marble. These statues are located on the hill, on a platform. As the base of Lord Shiva's statue, there is a stream that flows all the way to the foot of the hill. There is aropeway service that allows visitors to access the hill and offers stunning view of the city and the Bay. There even is a scenic and panoramic road leading to the top of the hill. Located along the coast of Vizag, Rama Krishna Beach is known for its pristine sands and crystal clear waters of the Bay of Bengal. It is adjoining the Lawson's Bay Beach and offers awe-inspiring natural views and vistas. The beach is perfect for catching mesmerising sunsets and sunrises. 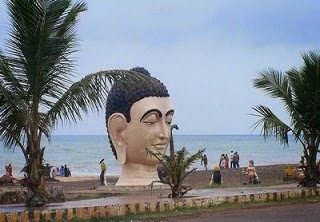 The beach is home to the Kali Temple, VUDA Park, a submarine museum and several roadside eateries and restaurants. While the Rama Krishna Beach is not safe for swimming, there are many attractions and activities to keep visitors busy. There is a poignant war memorial on the beach called the Victory at Sea. This memorial is dedicated to the memory of brave soldiers, who laid down their lives during the 1971 Indo-Park War. The city of Vizag offers so many creative and unique attractions that visitors will often be overwhelmed by them. One of the innovative attractions of the city is the submarine museum. Located on the Ram Krishna Beach, this museum is housed inside a real submarine. INS Kurusura is a Soviet-built submarine which was decommissioned on February 28, 2001 after serving the nation for 21 glorious years. The submarine with all its weaponry and fittings was hauled on to the beach and placed on a concrete foundation at the Gajapathi Raju Marg on the beachfront. Dolphin's Nose is a huge rocky headland, around 174 metres in height. 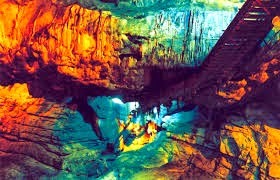 It is located in the southern part of Vizag. The rock gets its name because of its resemblance to a dolphin's nose and is located 358 metres above sea level. It projects majestically out into the Bay of Bengal and is a natural formation that attracts many visitors.On top of rock formation is a huge lighthouse, which is renowned for its powerful beam. The light beam can be seen far out in the sea, about 64 kilometres from land. This is the oldest lighthouse in the city and offers stunning and panoramic view of the Bay and the city. enthralling as the train meanders through dense forests, tunnels and hillocks. Jungle Bells is spread over an area of five acres and boasts of 18 beautifully furnished cottages. The surrounding forest is teeming with a wide array of wildlife.Visitors also can enjoy hiking, trekking, bird watching and visiting tribal hamlets located within the forest. gets transformed to a hue of vibrant colours, with people splashing color and water on each other. Located on Bhimli Road, Rushikonda, this beautiful beach resort has a presidential suite, 10 luxury rooms, air-conditionedexecutive and deluxe rooms and standard air-conditioned rooms. Guests can enjoy the beautiful waters of the Bay of Bengal and the pristine sandy beach while staying at this resort. 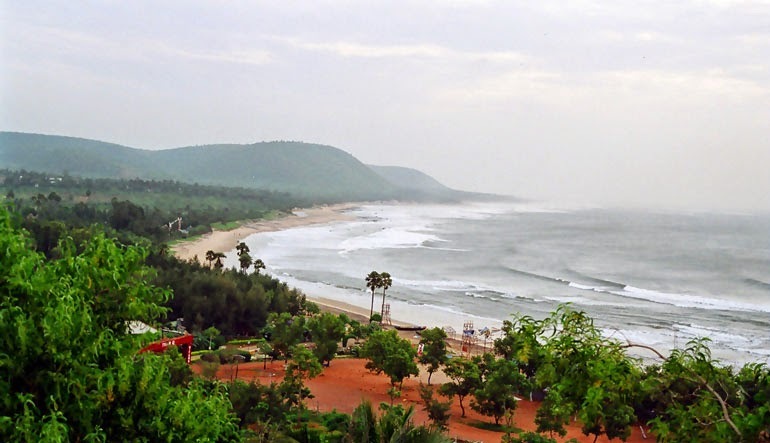 locals, but even visitors to Visakhapatnam should make it a point to enjoy the breathtaking beach. 32nd National Games. Sports lovers can enjoy expert guidance in skating at the Park from 9 am until 8 pm. The Indira Gandhi Zoological Park in Visakhapatnam is located on the national highway and covers an area of 250 hectares. This is the second largest zoological park in the state, after Hyderabad Zoo. It boasts of a rich collection of flora and fauna, including some exotic species of animals from Australia. The Park has more than 400 varieties of fauna. The Park opened its doors to the public in 1972 and today offers deer safari, has five enclosures for monkeys and primates, special dens for lions and tigers, six enclosures for deer and eight specially designed enclosures for small mammals. The main attraction of Indira Gandhi Zoological Park is undoubtedly the big cats, in particular the white tiger. Also known as Simhadri, the suburb of Simhachalam is located close to Visakhapatnam, about 16 kilometres away. It is home to a Hindu temple, which is dedicated to an incarnation of Lord Vishnu. The temple shows a synthesis of Oriya and Dravidian styles of architecture. It is considered as one of the eighteen shrines of Lord Narasimha. The main deity housed in the sanctum sanctorum gives holy appearance in its true form just for 12 hours in the year. The remaining time, the deity is covered with sandalwood paste. The temple is known for its exquisite sculptures. Bheemunipatnam is a town located close to Vijayawada and is known for its historical heritage. Local legend claims that the town was established during the days of the Hindu Epic, Mahabharatha, and was named after Bheema. However, archaeological evidence discovered in the region puts the origins of the tow to about 3rd century BCE and shows that the town was closely associated to early Buddhism. The town is home to the beautiful and tranquil Bheemunipatnam Beach, which is located at the confluence of Gosthani River and the Bay of Bengal. Visitors can visit the remains of a 17th century fort and cemetery which were constructed by the early Dutch settlers. Visitors can find remains of the Dutch East India Company here, in particular a port, which is not in ruins.